When developing Cardhop, Flexibits aimed to do the same thing for contacts that it did for the calendar - turn an app that can be dull, unintuitive, and slow into a robust, streamlined app that offers a lot more utility. Cardhop imports all of your contacts from your Mac (which are typically also synced with iOS devices using iCloud) and it provides an interface that makes it easy to search for an existing contact or add a new one using the same natural language parsing that's available in Fantastical. A search for "Eric" for example, will bring up the card for a contact named Eric, with information like phone number, email address, birth date, home address, Twitter handle, Facebook profile, Skype username, and more. There are dozens of fields that can be added for each contact. Entering a phrase like "Eric 867-5309 work" will automatically add the phone number you entered to Eric's contact card under the work heading, and similar phrases can be used to quickly update or remove information for all contacts. 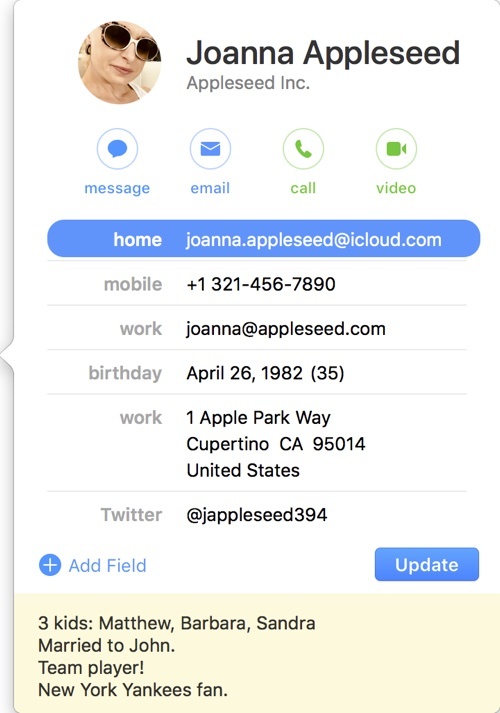 Added information will sync to the default Apple Contacts app. If you start typing a name that's not already in your contacts list, Cardhop will automatically add a new entry with the information. Groups of contacts are also supported, so you can create a group like "work" to automatically send an email or a message to everyone you work with. Cardhop's most useful feature is perhaps its quick actions. Every contact card in Cardhop features four customizable quick action buttons for interacting with contacts and performing tasks like placing a call, sending a tweet, or sending an email. The following quick actions are available: Call, Copy, Directions, Email, FaceTime, FaceTime Audio, Large Type, Message, Skype, Telegram, Twitter, URL, and VoIP. Clicking on one of the quick action buttons performs the task assigned to the button, but typing a quick action like "Skype Eric" or "Message Eric" also works. When using the call feature, there's also an option to place the call on your iPhone from your Mac using Bluetooth. Cardhop has the potential to save time in a workflow because it automates tasks that would normally take several clicks. Cardhop also takes advantage of the underused "note" feature available in the default Contacts app, making a notes section front and center for each contact in the app. Notes can be used to add details about contacts that you want to remember, leading to richer interactions. "Until now, contacts apps were basically boring databases," said Michael Simmons, Co-founder of Flexibits. "Cardhop is an entirely different approach and we think it's going to simplify and truly change the way people think about and interact with their contacts." This seems to try to solve a problem I’m not sure I have. If it had a history / activity for each contact so i can neatly have all my emails organized it would be awesome. I've been using BusyContacts since it came out, very full featured app with an Activity pane for Calendar/Mail/Messages/Twitter history if you so desire. I've been using BusyMac apps for well over a decade, really great apps! I need this! but! with a historical view of all communications with my contacts. YOU ARE THE MAN!! i have been looking for something like this for a while now!!! I'm a big, big fan of Fanstastical its a huge part of my workflow. I'd like to try this out but I'm not sure if i need it. There is a free trial download on the company's webpage. Their apps are f**king amazing. Concur. I downloaded the Cardhop trial and I'm scratching my head wondering how Flexibits are going to sell this when BusyContacts does so much more. Actually, with or without BusyCa, who would pay so much for so few little? As to be expected from Flexibits, Cardhop feels and looks amazing. I am a bit underwhelmed by depth of features, however. I was hoping for more feature parity with BusyContacts, which integrates and shows Calendar and Reminders events tied to each contact, along with recent email. As it stands, it's a beautiful version of Contacts app. There are essentially 3 tiers of highly native Mac contacts management apps. 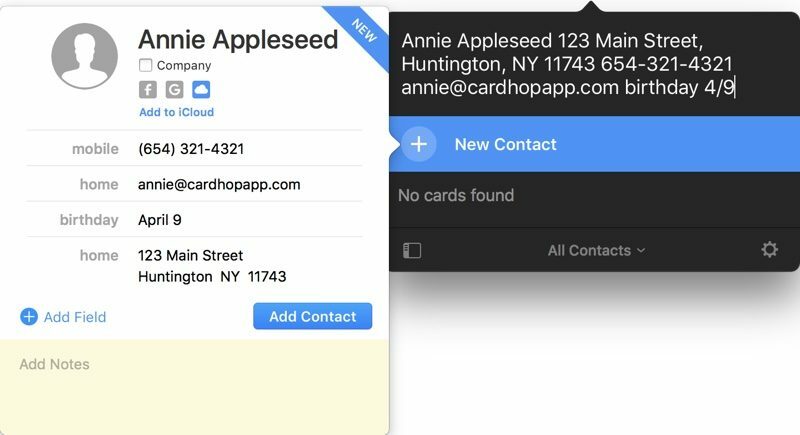 * Cardhop ($14.99): Prettier and more intuitive reimagining of Apple's Contacts app. 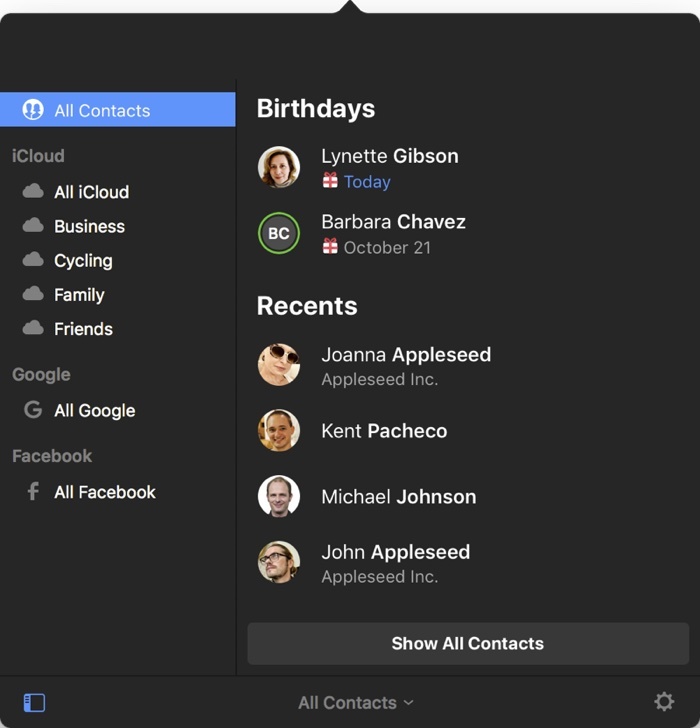 * BusyContacts ($49.99): More Outlook-like all-in-one CRM style contacts app that integrate with Contacts, Calendar, Reminders, Mail. * Daylite ($345.95 or $24/month): Full featured CRM solution, with lead and project management. I was hoping Cardhop would at least integrate with Flexibit's own Fantastical and Chatology, but alas, its functionalities in the first version remains focused and limited.